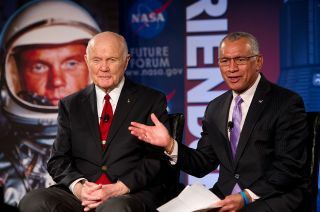 John Glenn (left) with NASA Administrator Charles Bolden at a NASA Future Forum in 2012. John Glenn was an outstanding aviator, astronaut and ambassador for the American space program, but he was an even better human being, NASA Administrator Charlie Bolden said. "John Glenn the astronaut? Yeah — great. John Glenn the humanitarian, John Glenn the human being, John Glenn the husband, you know, the loving husband — that's what I'll remember forever," Bolden said in a NASA video tribute, choking back tears. The NASA chief is one of many in the spaceflight community and beyond now mourning Glenn, who died yesterday (Dec. 8) at the age of 95. On Feb. 20, 1962, Glenn — one of the original seven astronauts chosen by NASA in 1959 — became the first American to orbit Earth, bringing the United States roughly level with the Soviet Union in the Cold War space race. Glenn set another record in 1998 at the age of 77, becoming the oldest person ever to reach space, completing the feat as a crewmember on the space shuttle Discovery's STS-95 mission. He accomplished a great deal in other walks of life as well: Glenn was a highly decorated fighter pilot who flew many combat missions in World War II and the Korean War, for example, and he served for 25 years as a U.S. senator from his home state of Ohio. Indeed, service was a core part of Glenn's life, Bolden said. "He embodied taking care of your people," the NASA chief said. And at Ohio State, Glenn "adopted as his focus for life bringing young people in to have opportunities to get to do and see some of the things that he had seen, if they realize that science and math [are] critically important," Bolden said. "That's the John Glenn that I hope people will remember forever."